This recipe is in response to emails I received when I did live BBQ segments with zany KTLA5 anchor Wendy Burch in May 2015. 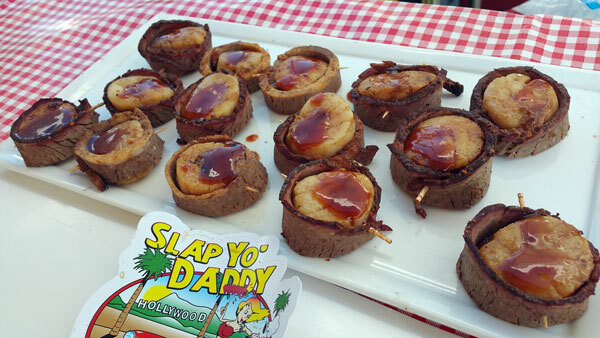 Folks wanted to know what was that surf-n-turf doohicky I made that morning of the live shoot. It was just my riff on the classic bacon wrapped scallops. You grill or hot sear the scallops and then wrap it with cooked beef of your choice. 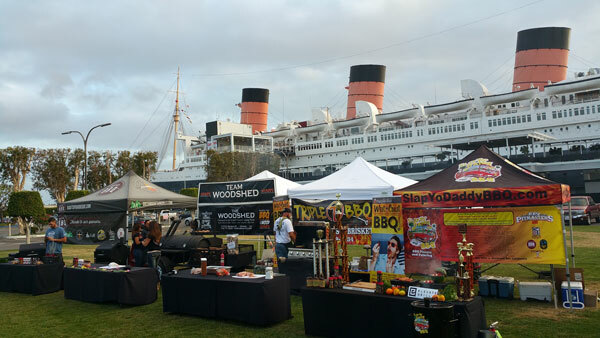 It can be done with rib eye, sirloin, tri tip, or brisket. If you like pastrami, you can wrap the scallops in pastrami also. 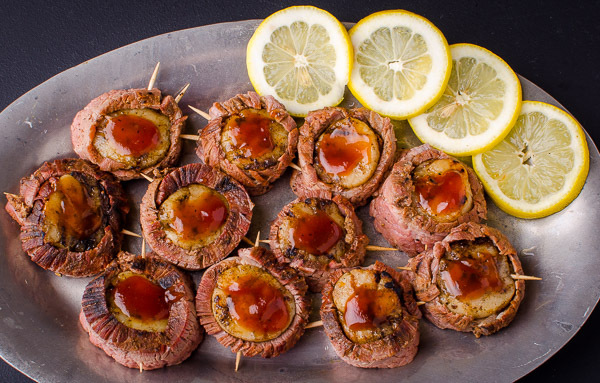 My buddy Steve Botkin of Desperado BBQ was helping me with the shoot and he made some brisket so it was an easy dish to assemble quickly for the camera as I wrapped my brisket slices around cooked scallops and garnished it with some barbecue sauce. 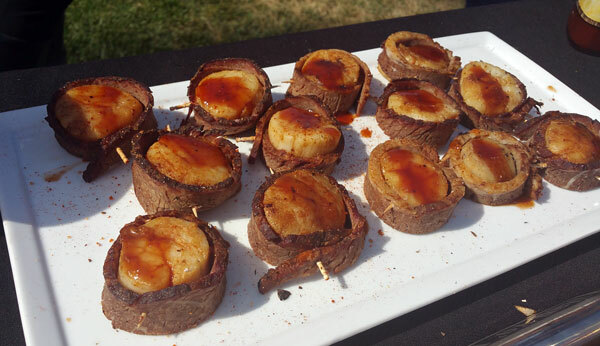 Give this idea a go with any cooked beef you might have handy for a quick and easy surf n turf appetizer. Preheat your kettle grill with ½ chimney of hot coals. Dry your thawed scallops (if frozen) on a paper towel. If your scallop is wet, you will not get a nice char as water is the enemy of crust. 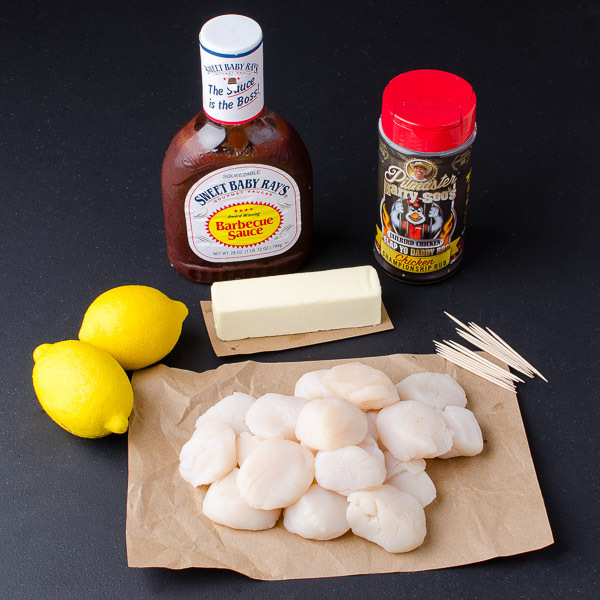 Coat the dried off scallops with a thin coat of cooking oil and sprinkle with a little salt before grilling. And two-thirds of the way into grilling, sprinkle on a good amount of SYD chicken rub. This allows the rub to cook in a bit but without burning. 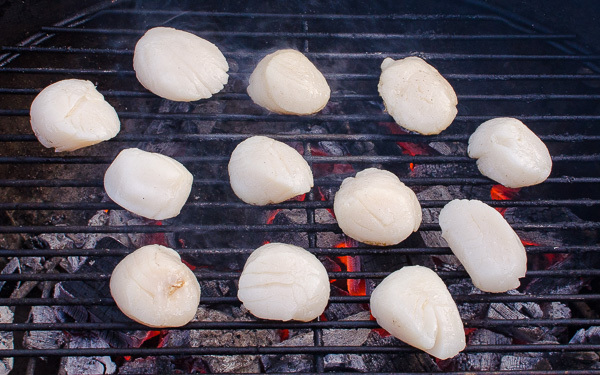 Cook the scallops on very hot grill or a carbon steel pan on the grill. You can also do this on a saucepan on your kitchen stove. 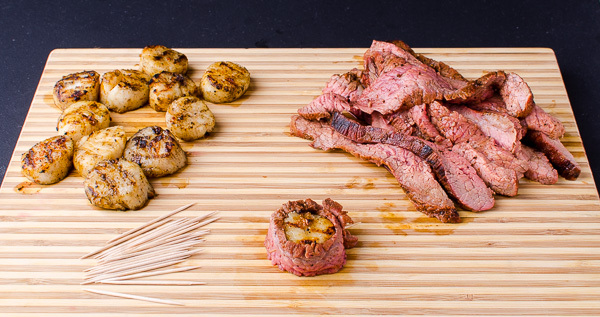 Wrap your grilled scallops with cooked beef of your choice and fasten with toothpicks. I like brisket or tri tip best to go with my scallops. Sirloin, ribeye, or flank steak is also good. 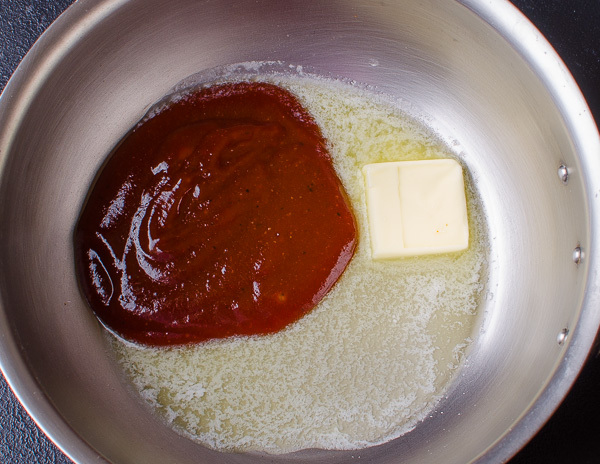 Warm the barbecue sauce and butter in a small pot. 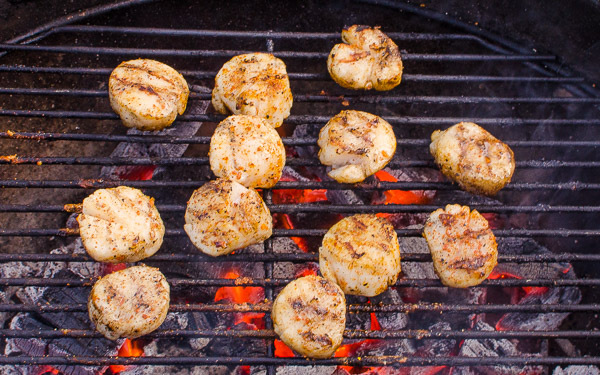 This scallop recipe works well with brisket slices or tri tip. Yo Jo, the key is to get larger scallops. Fresh is good if you can find it but frozen is also OK. Bit pricy at $1.00 each but well worth the effort. Give it a go and I know your family and friends are sure to be impressed! 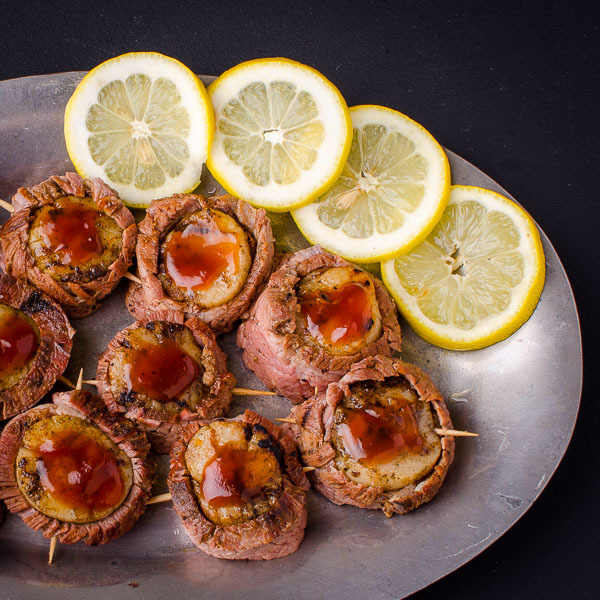 Just get ya some cooked meat and some seared scallops and you’ve got a winning appetizer to impress your guests! Omg Good!!! So good forgot to take pictures, oh well next time Lol! Could you cook the scallops and thin sliced beef together?